Would you like to know How to Easily Remove Pomegranate Seeds? Is it the whacking method with a wooden spoon? Or perhaps the underwater experience? Do you trust Martha Stewart or Jamie Oliver’s method? Only one way to find out! Have you avoided eating this wonderful ruby red fruit because it was too messy to deal with? 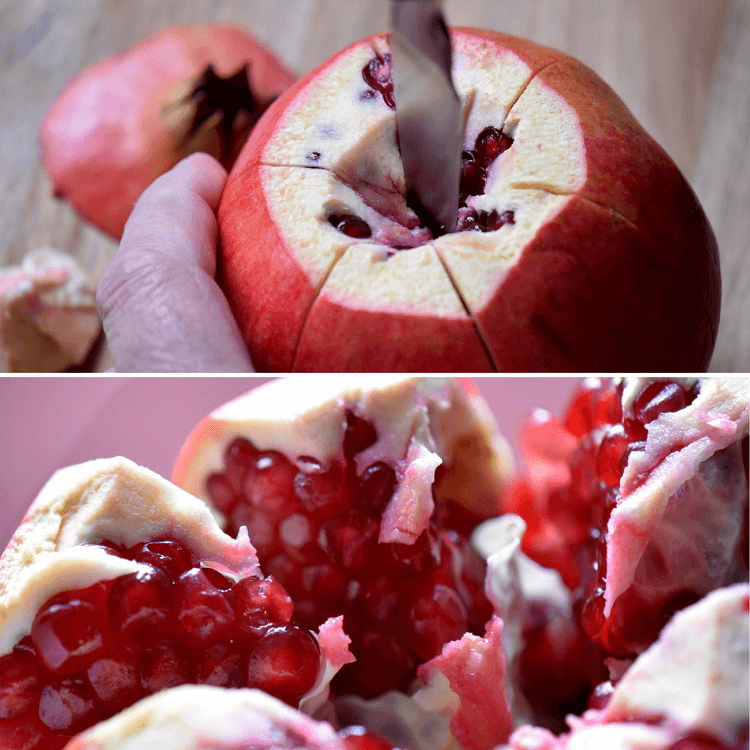 Or perhaps you are not really sure how to open a pomegranate, so you figure why bother? 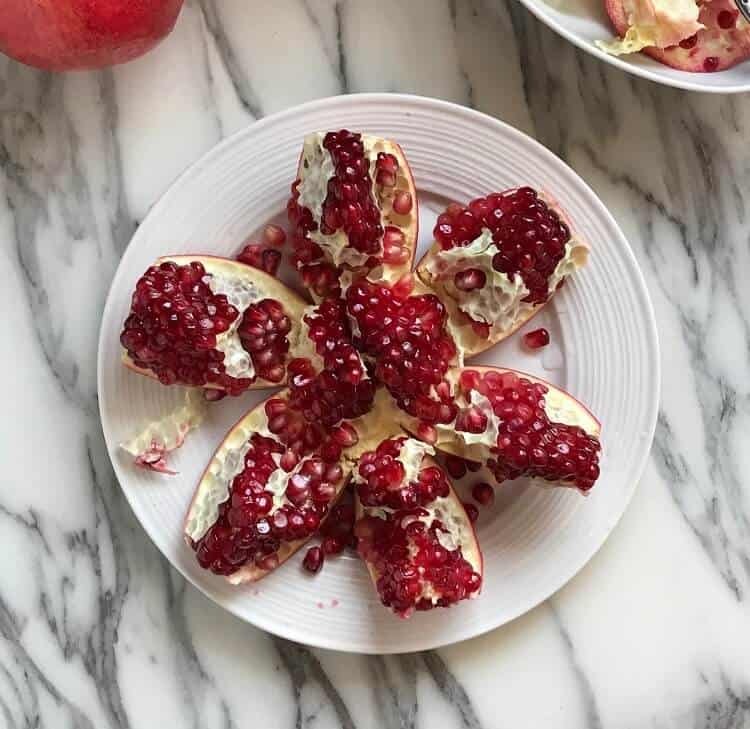 It is my hope that once you see for yourself How to Easily Remove Pomegranate Seeds, you will be as excited as I am when pomegranates are on the market! Pomegranates are usually in season (in the Northern Hemisphere) from late September right through to February. 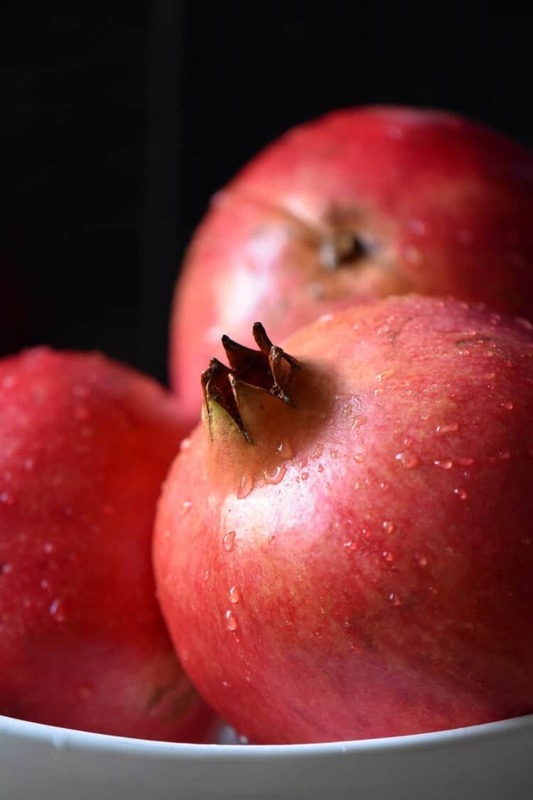 Before discussing the best way to remove pomegranate seeds, also referred to as arils, it is important to choose the best pomegranates. There is nothing more frustrating than spending a few dollars on a pomegranate, prying it open, only to find it is unripened or past it’s due date. Weight: Look for a pomegranate that feels heavy for its size. You should be pleasantly surprised as to how heavy it feels, once you have picked one up. This is a sure signal that the pomegranate seeds are juicy. If not consuming right away, refrigerate your pomegranate to ensure freshness. The entire pomegranate can be refrigerated for a few weeks or if you prefer, the seeds can be frozen. 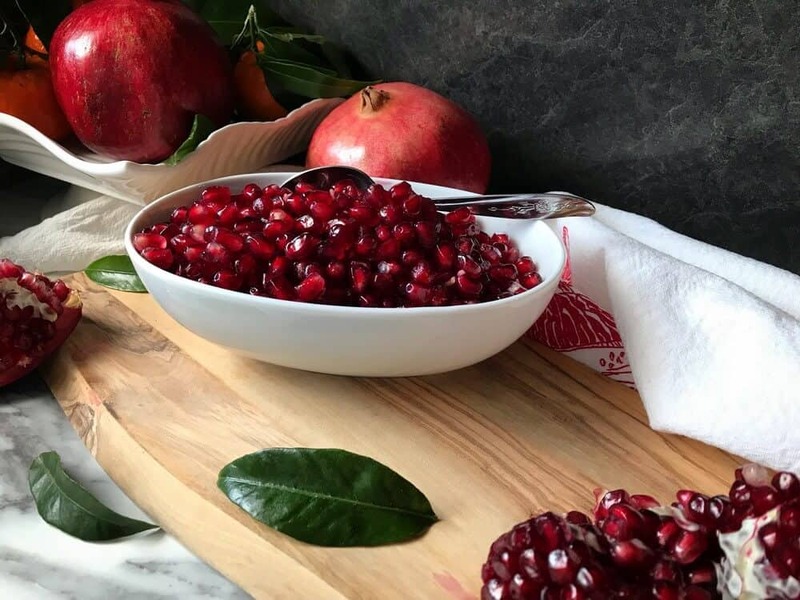 How to freeze the individual pomegranate seeds: Simply place the seeds on a baking sheet which has been lined with parchment or wax paper. After a couple of hours, place the individual frozen seeds in a resealable plastic bag or container. This is so convenient, especially when you want to sprinkle a few seeds on yogurt, a breakfast bowl, a dessert or in salads like this Fregola Spinach Pomegranate Salad. Now that we have purchased the best pomegranate, let’s quickly examine the exterior and interior of a pomegranate. This will help us understand why and where certain incisions are made. The exterior: Notice how both ends of the fruit are very different. The pomegranate crown is considered the top of the fruit. This is where the blossoms sprout. This is also the part that we will need to cut off, in order to get access to the seeds. The other end is referred to as the bottom of the fruit. This is where the fruit was attached to the tree. 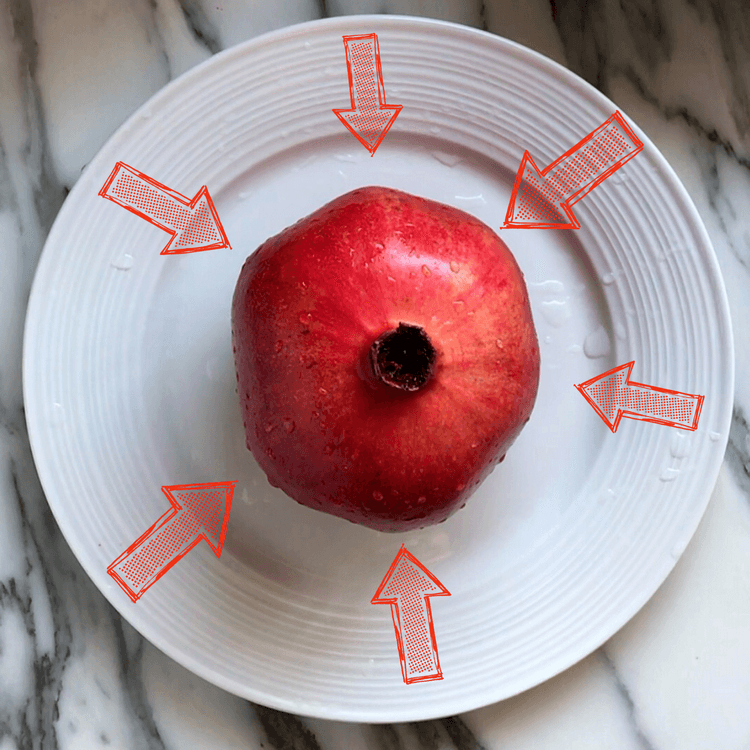 The presence of a hexagonal shape is not only an indicator that the pomegranate is ripe, but it will serve as a guide as to where to score the fruit. The interior: Every pomegranate has several sections which are separated by a non-edible, bitter tasting, white membrane. This membrane will act as a natural separator. At the base, you will notice another cluster of seeds. When scoring the fruit, the goal is to cut through the leathery skin, without cutting the delicate seeds. Remember, these seeds are just bursting with juice. Now that we have demystified the pomegranate, it is time for the moment of truth. You will see that nature has a way of rewarding your patience when opening up this fruit with hundreds of sweet arils. That’s it! No wooden spoon and no water bowl. Let’s begin by rinsing the pomegranate with water. 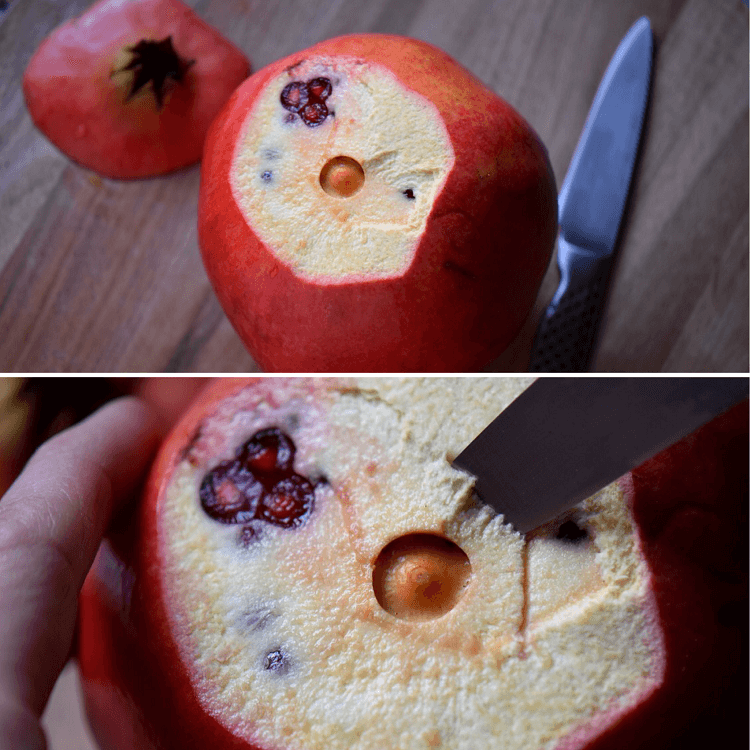 Using a sharp paring knife, make an incision, all around the crown of the fruit. The incision should be about 1/2 inch from the crown. Gently pull it off. The white membrane is now exposed. With the knife, make a few angular 1/2 inch cuts in the white membrane located in the center of the fruit. This part can now easily be removed. Now that we have a better understanding of the composition of this fruit, it makes sense to make six incisions on the outside. The scoring of the pomegranate at these particular points will correspond to the protruding part of the hexagonal shape and the positioning of the interior white membrane. Isn’t nature wonderful? It naturally separates the pomegranate into sections for us. Gently insert the paring knife, about one inch, in the middle white pith and give it a gentle twist. Firmly grasp the pomegranate with your fingers, and gently pry the pomegranate open. Congratulations! 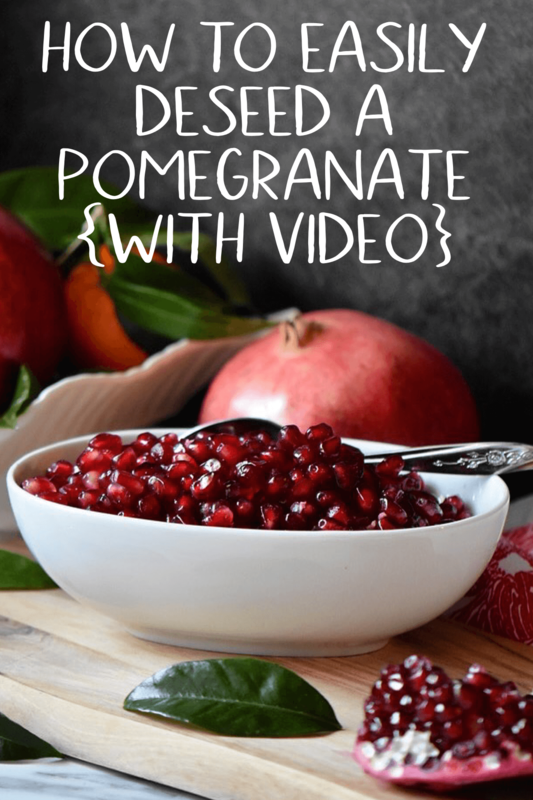 You have now learned How to Easily Remove Pomegranate Seeds! You now have access to all the jewel like seeds. Separate each section from the base and begin to “pop” the sweet seeds of each section in your bowl. It is easier to remove the seeds if the pomegranate is cold, that is, not at room temperature. 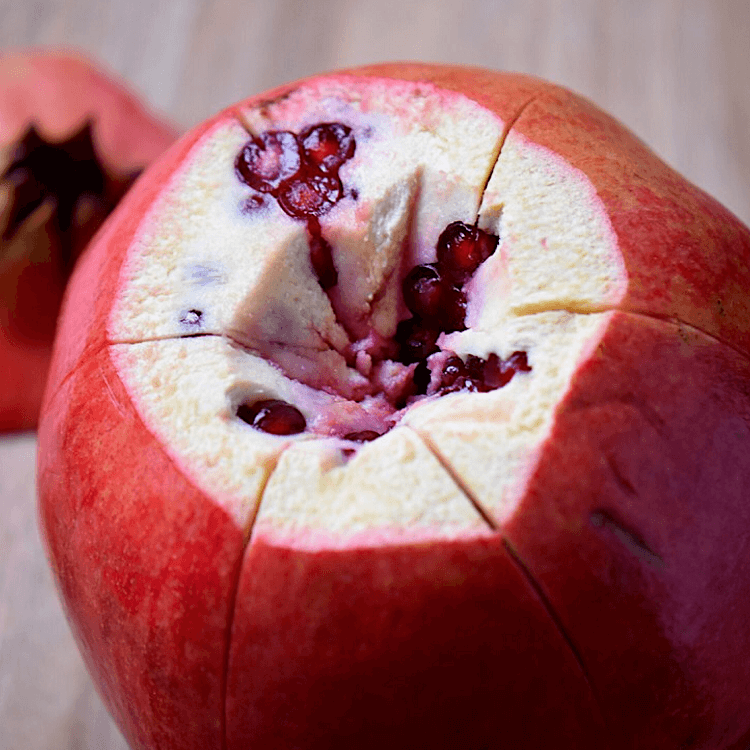 It seems that everyone has a method for the best way to remove pomegranate seeds. Both Martha and Jamie (Home Cooking Skills) have also expressed their opinion on this. There are those that will cut the pomegranate in half and proceed to whacking each pomegranate half with a wooden spoon until all the arils fall out. I am sure you have also seen the method where the pomegranate half is submerged in a bowl of water where the arils are then removed. In my humble opinion, if you find a method for how to deseed a pomegranate that works for you, fantastic! I have just shared my method for the best way to cut a pomegranate, based on my personal experience and my lifelong obsession with this wonderful fruit. 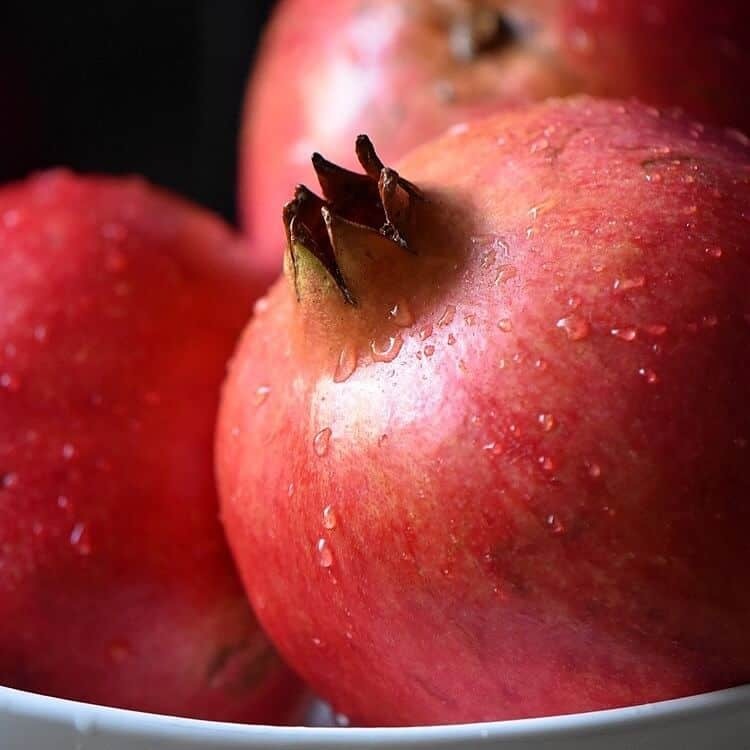 No matter how to get pomegranate seeds out, what is important is that you eat this wonderful super-food! Pomegranates seeds are full of antioxidants, and are a great source of Vitamin C among other vitamins and minerals. They are also a great source of fiber. So, please stop avoiding this ancient fruit which has been around since the beginning of time… and that’s a long time! Do you eat pomegranate seeds? 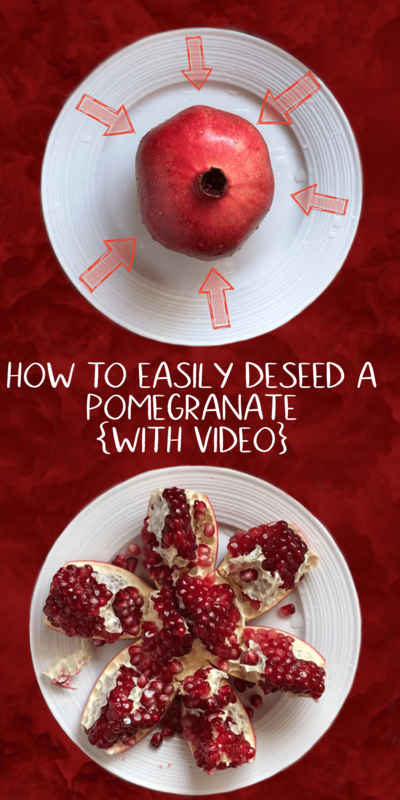 Now that you know how to seed a pomegranate, I hope you will! 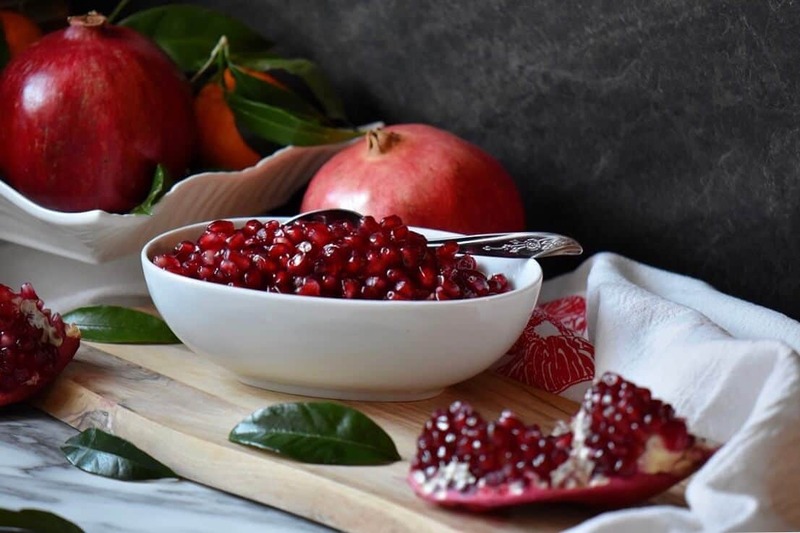 ★★★★★ If you have tried this method to remove pomegranate seeds, I would love to hear about it in the comments below and be sure to rate the recipe! 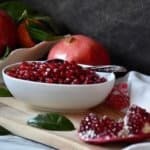 Would you like to know How to Easily Remove Pomegranate Seeds? Only one way to find out! Rinse the pomegranate under running water. With a sharp paring knife, make an incision all around the crown area, about 1/2 inch from the top. Gently remove this top piece. Make a few angular 1/2 inch cuts in the white membrane located in the center of the fruit. Gently remove this white section. Score the exterior of the pomegranate along the "ridges" from the crown to the base. Gently insert the knife, (about one inch) in the middle section of the pomegranate and give it a gentle twist. Firmly grasp the pomegranate with your fingers, and gently pry the pomegranate open. This will reveal the sections. Detach each section from the base and begin to gently pop the seeds in a bowl. Discard the white membrane. 1 serving = 1/2 cup. Holy moly, this actually worked. Tidier than Martha Stewart’s method and yielded more than hers did the previous time I attempted it. Love that I can usually buy just the seeds but not so here in Melbourne, Australia. JUST USE THIS METHOD. Or buy the damned seeds if you can find them. This is one of my favorite fruits… I tried so many methods, including “whacking” it and it was one big fat mess. So, I have my own method for doing this but yesterday when faced with the task I followed your instructions to a T, starting with selection of the pomegranate. Readers – this works exceptionally well, I suggest you bookmark the post. Very useful ! thanks you very much!!! Wow, I had never heard about this method! Wish I did before opening (and fighting, yet again) with the one I have at home tonight. Will try it next time. Thanks! !